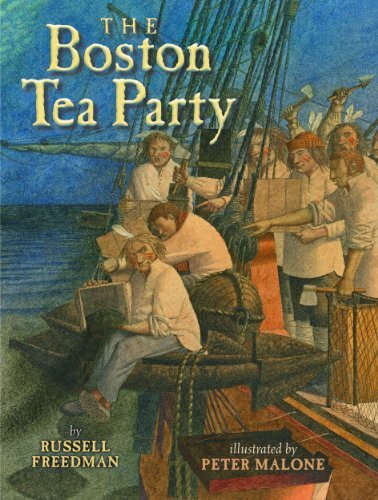 Russell Freedman, with his keen ability for making nonfiction topics interesting and fun to read about, has turned his trusty pen to introduce young audiences to details about what we now refer to as The Boston Tea Party. In 32 pages, Freedman's well-executed narrative takes those few lines we’ve been reading in history books for decades, “On the night of December 16, 1773, a band of colonists disguised as Mohawk Indians boarded three merchant ships that had arrived from Britain and anchored in Boston Harbor. Working quickly and silently, they hoisted thousands of pounds of tea up from the ships’ holds and dumped the tea into the sea.” and flushes it out, giving us the details that conveys how truly rebellious this act was, the act that started America’s war for independence. Freedman presents the information chronologically, giving readers the understanding of how slowly things progressed back in the 1770’s, long before instant messaging and cell phones. On November 28, 1773, the merchant ship Dartmouth sailed into Boston Harbor, with a cargo of 114 chests of fine blended tea. A town meeting was called and it was agreed that any attempt to unload the tea would be blocked. Everyone had to wait twenty days. “Under the law, a ship had twenty days after reaching port to unload its cargo and pay any taxes, or to sail away. Once twenty days had passed, the ship’s cargo had to be taxed.” Friday, December 17 was the end of the 20 days. Mirroring the text perfectly are the illustrations painted by British artist Peter Malone. Done in watercolor on Saunders Waterford, hot pressed paper, these historically accurate paintings do reflect the high emotions that were raging during this time. We see anger, shock, and some mischievous smiles all captured on the faces in the crowds or of those standing off to the side, quietly observing what is happening. The dumping of the tea was a highly organized and very respectful act, done without violence. 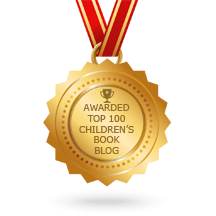 A large crowd, over a thousand, stood on Griffin’s Warf, where the ship was docked, and silently watched as those disguised as Mohawk Indians boarded. Alexander Hodgdon, a mate on the Dartmouth, explains, “They came on board the ship, and, after warning myself and the custom-house officers to get out of the way, they [opened] the hatches and went down into the hold” where the tea was stored.” I loved knowing that because it was low-tide, the tea, once thrown overboard, “began to pile up like stacks of hay.” Malone’s illustrations show the apprentices who jumped overboard wading “through the chilly December water, using shovels to scatter the tea more widely." Of course, we know that a year and four months later, on April 19, 1775 the opening shots of the Revolutionary War rang out. The rest, as they say, is history. Included is a historic map of the Town of Boston, an afterward, timeline, source notes, and index. 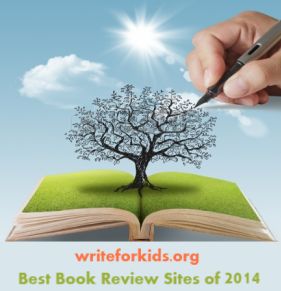 The Boston Tea Party is an excellent book that would enhance any school and public library collection. Make up a display of other American history books written by Russell Freedman:Give me Liberty! the story of the Declaration of Independence, Lafayette and the American Revolution, and Washington at Valley Forge, or with some historical fiction titles: Johnny Tremain by Esther Forbes, Chains by Laurie Halse Anderson, Astonishing Life of Octavian Nothing by M. T. Anderson, and George Washington’s Socks by Elvira Woodruff. 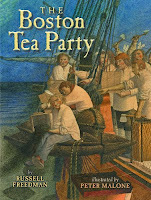 To learn more about The Boston Tea Party visit web sites of the Boston Tea Party Ships and Museum. or the Boston Tea Party Historical Society.